Seven years ago my husband and I started a tradition. 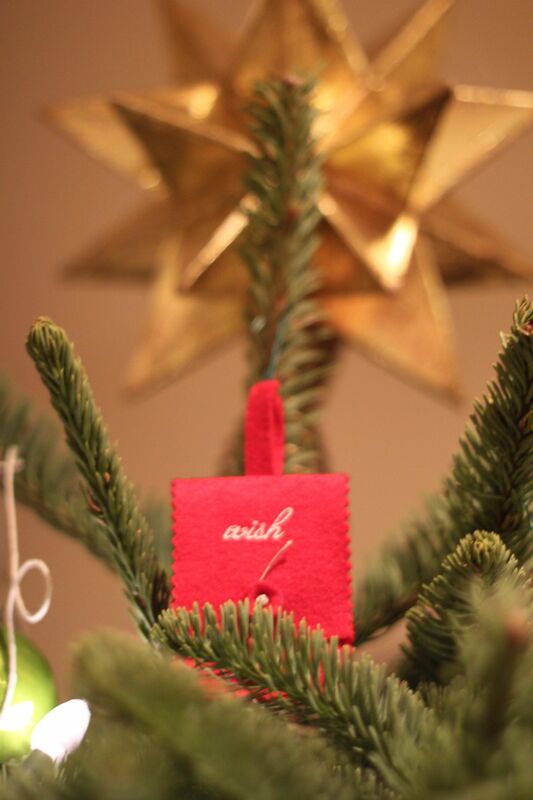 I received a Starbucks gift card from a student with an ornament attached; a tiny red felt envelope with the word “wish” embroidered in white on the flap. Each Christmas we write down our hopes for the upcoming year on a small slip of paper, slide it inside the envelope, and hang it on the tree. It always makes me smile to find this fraying little treasure tucked amongst the bubble wrap of ornaments and lights. I corral all four of us onto one couch and read aloud our requests from years past before recording our new wishes and hanging the envelope in it’s rightful spot at the top of the tree by the star. This year big brother wished for more doggies, and little bro wanted a toy papa. Papa wisely wished for more patience. And then it was my turn. As I looked down at the paper-thin wishes piled in my lap there was one thing I knew for certain. It was time for a change. Have you heard the Albert Einstein quote, “Insanity is doing the same thing over and over again and expecting different results”? Although I teeter on the brink of crazy every now and again, I will insist that complete insanity is still an exaggeration of my current state. This may not be the case forever. Still, being confronted with my hopes of years past made me wonder. Each and every wish since the birth of my children had sounded like a desperate parental plea for help – more presence, less work, more time, less worry. And what I realized at this moment is that even with all the effort I seem to make, if I were to look back on this bundle of wishes twenty years from now and only find a redundant collection of should-have’s, I can only imagine the regret that I would feel. Aren’t wishes supposed to be for the spectacular? The nearly unattainable? The far reaching almost impossible dreams of childhood? Wishing for more sleep and fewer dishes was certainly a sign of the times, but these are not the lofty hopes I’d like to look back on some day far from now. So, you are wondering, what did I write down this year? Well, I recently heard a wise woman say that the key to happiness is to wake up each and every morning with the excitement of a child going to Disneyland. I was so struck by this idea that I wrote it on a post-it and slapped it onto the wall next to my bed a couple of months ago to see if she was right. I am happy to report that the best days are those when my eye catches sight of that little yellow square of genius before I tumble out of bed. So, backstory complete, what I wrote down today was this totally average and mom-ish wish: “Take more trips to Disneyland and spend more lazy days at home with the boys”. And what it really means is this: “Just be excited to BE”. Because while Disneyland is certainly adventurous, so are pajamas and Charlie Brown Christmas and egg nog. Chasing excitement is one thing, but finding excitement in the every day is the true stuff of life. Just being in my boys’ presence makes me a better person, regardless of the scenery. And while these are all things I completely and totally know as a mother, it stings a bit to admit that the best of intentions just don’t buy more hours in the day. There is no way to stall time or live it over again, as hard as I try with my trusty camera. Who my children are now is not who they will always be, yet now is the only chance I have to soak it all up. And somehow, for me, waking up excited just to be their mom is the best way I know how to make this year’s wish finally come true. Your insights are so sweet. Happy dance! I love this ❤ Thank-you. Lovely! Gratitude abounds for you! This is profound, touching, and inspiring. “Dance like you do when no one is watching” which is what I did last summer at Disneyland when it was closing – I had to laugh at how many people joined in! We just took the boys to Disneyland on Friday, Winkee, and did the same!